It is the 25th of the month and you know what that means...Time for the January Rudolph Days Challenge. Here is a quick recap of the new Rudolph Days Rules. 1. Rudolph Days will start monthly on the 25th and will close on the last day of that month. 5. Prizes will be shipped anywhere in the world. 6. The winner will be selected by random draw and announced on the first day of the following month. We have two guest designers who have kindly agreed to help me out this month. Many of you know that I moved house two days ago. We are still busy cleaning etc back at the old house, as the new owners take possession on the 26th. 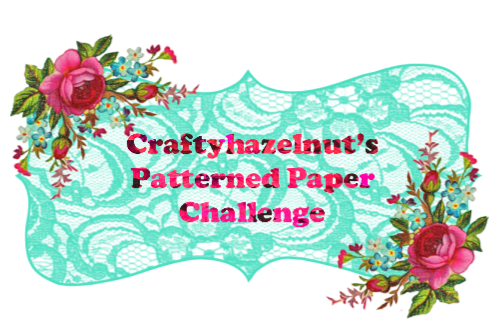 I may not be able to get round to each entry this month, so it is great to have the help of Mary H and Kath K as my guest designers! 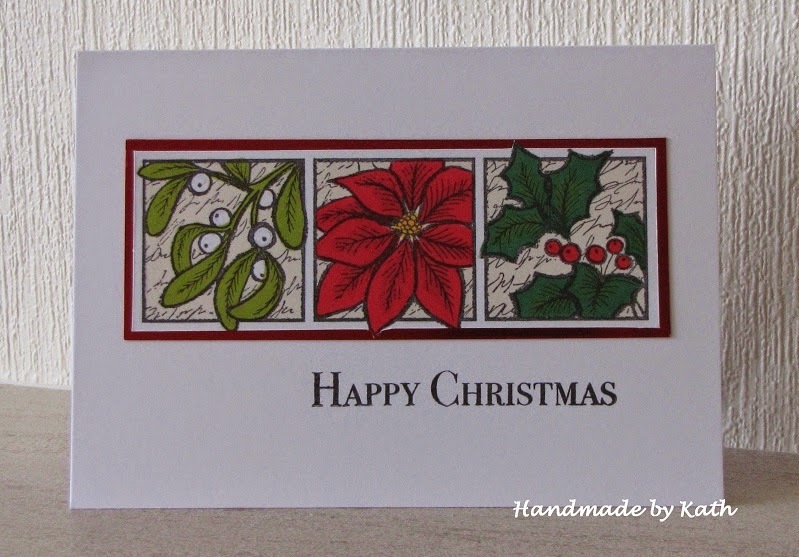 Kath K of Handmade by Kath has some more inspiration to share, with this wonderful Christmas Card. Pop on over to Kath's blog for additional details and even more Christmas inspiration, Kath's goal this year is to make 10 Christmas cards every month! This should be fun to view. Here is my Rudolph Days card for this month. I made it ahead and auto scheduled this post as I do not know if my internet will be hooked up and working on time. I made this card from a topper I purchased at my local papercrafts store. They were selling off hand coloured toppers from their card classes! I picked up a few to use during the move. At 50 cents a topper, they were a great bargain! I set it on a snippet of burlap and fringed the edges for a bit of texture. The poinsettias are ones I picked up at Michaels a couple of years ago. I always stock up on embellishments when they have the after Xmas blow out sales. The sentiment is a rub on from my stash, and the silver glitter holly is a new die I got for Xmas. Background papers are snippets from my stash. Sorry that I do not have the manufacturers names for everything...I made the cards a couple of weeks ago and have packed my craft room completely now., so have no way to look them up. I should have thought to make them down on a sticky note as I was creating! The January Rudolph Days prize is this Memory Box MERRY die. Good luck! Hi there Mo! Well done on getting RD organised bang in the middle of your move. Love your card as well as the DT ones. Hope your move went well. what a huge pile of presents! such a cute card with so much detail. Thanks for continuing this fun challenge. I too hope to make ten a month, but we'll see?!! Wishing you success and many entries! I love your mousey card with the burlap, and the color of those presents remind me of MaryJane candies - do you have them across the pond? Such a fun creation for your first Rudolph challenge! Fab makes by you and the GDT. I am delighted that the still ongoing challenges Rudolph Days. I love them and wished I Sarn gave up them. This is great news for today, the fun continues. OOPs . . . soz . . . forgot to say how much I like Kath's and Mary's festive cards. They are both great. Your House Mouse card is SOOO cute too. Hmm . . . not sure my first comment went into place now . . . as there's a different message about my 2nd comment's visibility!. So, just in case my first one didn't publish . . . CONGRATULATIONS on hosting your first Rudolph Day Challenge Mo. It's a wonderful prize, but I'm playing just for fun thank you . Congrats on your move! It's soooo much work! Thanks for the Rudolph Day challenge - I'll be back to play along! Your GD elves have made beautiful cards - and so have you - gorgeous details and the burlap is a nice touch! Awesome prize - would love to win this! I'm going to get out my Christmas stamps once again and play this month - hopefully!!! Great cards by the guest designers and also love your card. The burlap looks so cute with that image. Thanks for taking over the challenge Mo. A lovely set of cards to start us off Mo. Your toppers were a good find weren´t they? Whew, I just got round to the evens, and saw some familiar names on the 'odds', so hadda have lookin there as well. Then realized I'd forgotten to leave Miss Scrappy a comment on her beautiful card. Love the image, great coloring and the burlap background adds so much interest & texture.Loved those little stripe flowers that compliment the packages' coloring too. Brilliant card, and kudos to you, for getting one done with all the moving too! Thanks for hostessing this #1 Rudy Day. Hugs. for your first Rudolph Day challenge! Just added my link - hope you're getting settled in your new home! What a find, Maureen! This is a delightful topper and beautifully colored! Good luck with that move. Hope you find your stamps soon and have some time to play with them. I'm impressed that you can pull this off in the midst of moving. You rock! Your toppers were a great find and I love the burlap on your card. So fun! Hopefully the move will go smoothly and you'll be up and running with the craft stuff in no time. Your card is adorable! I think your papers are beautiful and they match the colors of the image perfectly. And I love texture on cards and this piece of burlap is a great detail. 27 entries by the 27th !! Love all three cards, may have to CASE Kath's. Now to take a peak at all the other wonderful creations. Congratulations on your first Rudolf Challenge post. I do hope your move is going well. Love your Guest Designers fab creations, and of course your super one too. Hi Maureen, I am just back to blogging lately and I saw your fun challenge. This is such a fun idea! I am happy to participate! Thanks for hosting! Great inspiration cards from yourself and you GDT, I love the little mice with their mountain of gift packages. I hope your house move went well and that the new one soon feels like home. Thank you for taking on this challenge especially in the midst of moving. And good luck with the rest of your move!! hi maureen, so glad you decided to continue the rudolph day challenge! fabulous cards by you and your guest designers; a great idea to motivate people to get cracking early on those holiday cards. Fabulous inspiration cards, thank you for hosting the challenge Maureen, I hope you are settling into your new home. So glad I manage to join in! 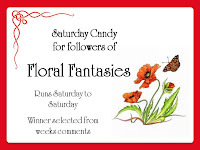 Congratulations to the lucky winner of a fab prize. Thanks again, Miss Maureen.